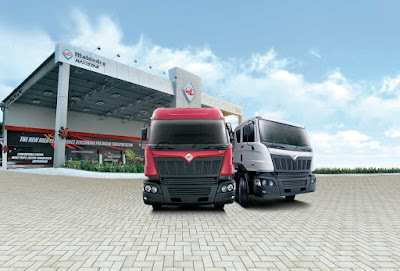 The revolutionary Mahindra Navistar trucks are manufactured by the Mahindra Navistar Automotives Ltd. (MNAL). The objective of Mahindra Navistar is to provide extraordinary performance resolutions to all its patrons through Mahindra’s expertise and provision. Mahindra Navistar trucks are now on the roads, earning rave reviews and excellent feedback from all of our customers. · "My MN 31 has been with me for 2 months and has covered 10000km. This vehicle runs 15% more than others. I still haven’t done any maintenance for it as yet, but experiencing good performance. "- Nand Kishore Baheti, Transport Contractor N. K. Baheti. · “We have been using two MN31 for last 2 months now. We are getting better pickup, comfort and mileage as compared to other vehicles in my fleet. Regarding the cabin, my driver is more comfortable in MN31 and prefers driving MN31 than other vehicles in our fleet. We are happy with the performance and also recommend it to associated truck proprietors who actually want to take out more profits out of the business.” - Gopal Chaudhary, R.D Enterprises, Kolkata.